These meat patties are known as Boulettes de Viande avec des Petits Pois, lamb-beef patties with almond, saffron, and peas. These are a bit time consuming to make, but for Passover, they are extra special and worth the effort. Recipe excerpted with permission from Too Good To Passover. To prepare the patties: Combine all the meat patty ingredients in a large bowl, squeezing until meat is soft and smooth. Heat about ½ cup of oil in a large skillet over medium-high heat for 3 minutes (oil should be about ½ inch deep). Test to see if oil is hot enough by dropping a small piece of meat in the oil. If it fries immediately, it is ready. Place the patty into the skillet and fry about 5 minutes on each side, or until a medium-dark brown. (Meat does not have to be fully cooked inside as it will be boiled with the broth in the next step.) Place patty onto a plate lined with paper towels to absorb excess oil, and continue until all of the patties have been dipped and fried in this manner, frying several at a time. To prepare the broth and simmer the patties: Heat the oil over high heat in a large, heavy-bottomed pot for 1 minute. Add the chopped onions and cook until transparent and soft, 2 to 3 minutes. Add the salt, pepper, turmeric, saffron (if using), and sugar and cook 1 minute. Pour the water into the pot and bring to a boil over high heat. Arrange the patties by overlapping them in a spiral shape so as to fit them all in, and bring to a second boil. Once water is boiling, reduce heat to low, and pour the peas over the top. Cover and simmer for 45 minutes. Uncover and continue to simmer 15 more minutes. 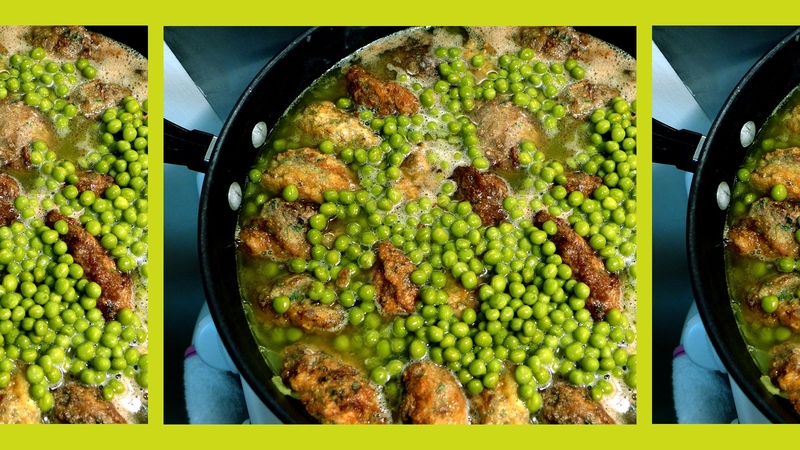 Serve the boulettes hot over broken pieces of matzah with peas and broth spooned over top.